Starting around your 40s, your metabolism slows more and more rapidly with age. That's because losing muscle mass is a natural part of aging. The more muscle mass you have, the faster your metabolism. With so many 50-and-over Americans falling victim to heart disease and diabetes, counteracting a slowing metabolism is important to potentially help prevent weight gain and resulting illness. To build muscle mass despite the effects of aging, stick to a serious exercise plan and optimize your diet for muscle gain. Never begin any new diet or exercise regimen without first consulting your doctor. 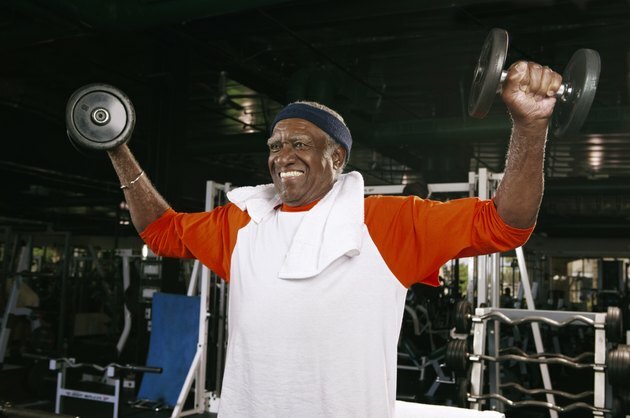 The American College of Sports Medicine recommends people over 50 strength-train all major muscle groups at least two and up to four times per week to gain muscle. Allow at least 48 hours between strength-training workouts for full recovery. Overtraining can cause injuries and setbacks in your plan, which can lead to muscle loss. It's also important not to under-train. For optimal health and fitness, you must do cardio training every week as well. Aging women are at a greater risk of osteoporosis than men and benefit from focusing on high-impact cardio as long as the knee joints can handle the weight; putting more weight and impact on your legs builds bone density. Again, consult a doctor to determine how much exercise, and what specific exercise plan, is best for you. Do one to two exercises per muscle group in each strength-training session. Change up the exercises from session to session. Remember to do exercises that target your chest, shoulders, biceps, triceps, abs, back, hips, glutes, quads, hamstrings and calves. Multi-joint exercises work more than one muscle group at once. For example, squats, lunges and leg presses build the glutes, quads and hamstrings all in one exercise. Over-50 adults should typically focus on multi-joint exercises more than exercises that isolate one muscle, since they improve stability, balance and coordination and can help you avoid injuries when doing other types of exercise. Other examples of multi-joint exercises are pushups, pullups, bench presses and shoulder presses. Again, always get clearance from your doctor first, then consult a fitness professional to determine which exercise plan is best for you. Choose the amount of weight you lift for each strength-training exercise based on the amount that tires you right before or at 15 reps. Do one to three sets of 10 to 15 reps for each exercise. If it's your first time doing an exercise, have a personal trainer assist you to make sure you use the correct form and help you choose your starting weight amount. Increase the amount of weight you use as you get stronger to avoid muscle gain plateaus. For better safety and to make sure you use the proper technique, choose machine weight exercises over using free weights. According to the American College of Sports Medicine, your maximum aerobic capacity also decreases over time, which lowers your cardio fitness level. To stay healthy, get aerobic exercise that works your entire body, like walking, jogging, swimming, dancing and the elliptical machine. Cardio workouts burn more calories than strength-training, so do more more cardio if you need to lose weight. The more active you are, the better. Find activities like gardening, walking the dog or taking a fitness class that you enjoy doing to help you squeeze in more aerobic workouts.